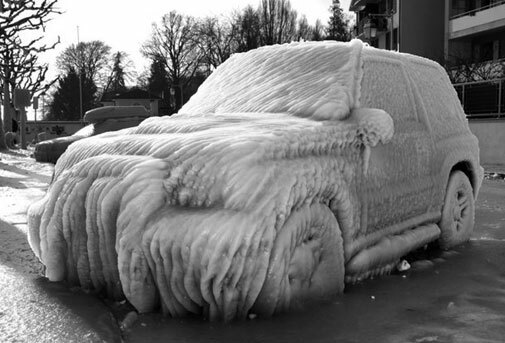 For sure a lot of drivers have used to find in the morning that their vehicle had been frozen. Many of them do not know what to do, or do not have enough time to react. So when you hear about the weather, that the night will be very cold and there will be precipitation of snow, prepare to become early and you can safely solve the problem. That’s not very pleasantly, but there are many things that can help to deal with the situation. If your locks are frozen , you can inject the defroster for locks inside or if you just fill the dropper or pipette with concentrated spirit, and do the same. If it is raining , then the temperatures sharply going down and it rain is transformed into snow is probably to find his car covered with a layer of ice. When the ice is thick, even ice scrapers can not handle easily. In this situation, you should take container with hot water (bucket, jug, bowl) and a sponge. Soak the sponge enough and go in the end of the door you want to open. But it may not work from the first time, so repeat this several times until the ice becomes thinner and can be removed with a scraper. Do not pour large amounts of hot water directly on the windows if the ice is thin – so threatening to burst the glass. Do not open the doors of the cars suddenly it may break the door handle, if is frozen, or to tear the frozen door seals. When you get inside the car, all other doors are still frozen, so start the engine, and let it warm up good. Turn the heater on high and point it to the windows. If your wipers are frozen, do not turn it on until you are sure they are defrosted. During this time, keep treating with hot water of the windows on the outside and help with the ice scraper. Are we sitting unless visibility is not great. Do not drive if your visibility is not excellent. The team of Top Rent A Car advised to carefully anticipate trips during the winter, and keep track of updated information on weather and traffic. Next:How the low temperatures affect the car?